Form, function and ethos. Theodore Marshall packs a lot into every surfboard that leaves his workshop, but what has that got to do with cabinetmaking? For a start, how many bits of furniture have you made that could take on the Pacific and come back in one piece? 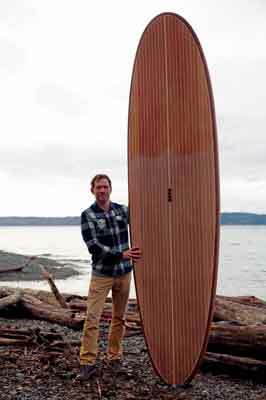 Known online as Cedarsurfer77, Theodore Marshall is a furniture maker turned surf and paddleboard maker. Based in Washington state in the Pacific Northwest, he uses sustainably sourced native woods to create his high-quality boards. 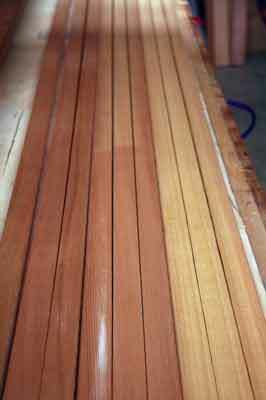 He recently set up the company Red Cedar Paddleboards. Theodore has always been creative and interested in art, telling us that as a child he always had a pad and pencil nearby: "Art had a huge influence on my life with how I viewed the world and how I wanted to be creating images," he says. He studied traditional art in high school and then at community college and spent a lot of his free time painting landscapes. However, his interest soon turned to furniture. 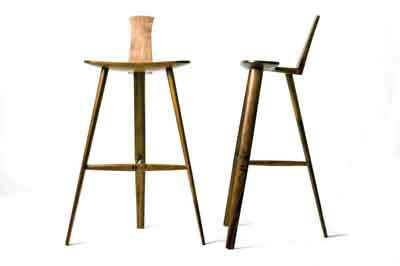 "After I met a friend on a jobsite and started to talk about furniture making, something just 'clicked'. Almost overnight I moved from making two-dimensional media into three-dimensional objects. I've had no formal training in woodworking, but could never seem to quench my thirst for knowledge. I started buying every woodworking book I could get my hands on and worked on building my skills." When he then combined these woodworking skills with his other main interest, it took his career in another direction. "I've always been around water and it continues to be a big part of my life. I'm an avid surfer and stand-up paddleboarder. A few years back I volunteered down at The Center for Wooden Boats in Seattle, Washington, where I spent time in the shop doing repairs and learning how boats were constructed. Combining those two worlds started to make more and more sense to me, so I started to educate myself about hollow wooden surfboards. 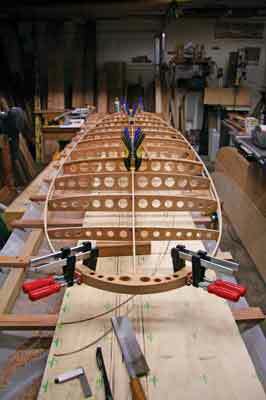 I found a great online forum that reaches out to woodworkers worldwide called Tree to Sea. I was able to build some of my first boards using information from that forum, and started to branch out more on my own." 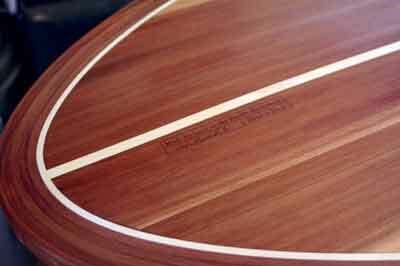 Of the paddleboards that he has made so far, Theodore chose one called 'Seahurst' as his favourite. This board is a 10ft 6in stand-up paddleboard, which was named after a waterfront park about a five-minute drive from his house. "I designed it as my 'all-in-one' style of paddleboard. It measures 815mm wide by 115mm thick and comes in at 163 litres of volume allowing it to float someone up to about 190lbs," he explains. "It has a moderate entry and exit rocker allowing you to take it out in mellow surf, but it also paddles well on flat bodies of water. I was inspired by traditional Chris Craft boats and used cedar (Thuja plicata) and aspen (Populus spp.) on the deck of my board to give it that classical nautical aesthetic." The design of a new paddleboard is a complicated process that requires a great deal of thought and planning. "You need to balance aesthetics with hydrodynamics. 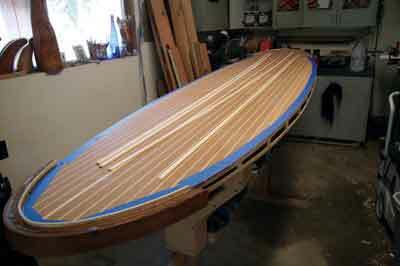 Building a paddleboard has similarities to traditional cabinetry with how everything starts off with parallel and perpendicular lines, but transforms into sculpture." Theodore uses both new digital technology and traditional techniques to design his boards. "I use CAD to design the interior skeleton and outline and make sure that I have fair curves everywhere that I need them. Once I have the design refined the way I want it, I export that information into another program that takes slices of the board and creates a full size printable PDF. I print that file out full size on a plotter and attach it to 6mm plywood with spray adhesive, creating a master set of router templates. I find that I am drawn to the classic aesthetics of vintage wooden boats, but I'm able to blend modern paddleboard and surfboard technology into them. It gives me the best of both worlds, which I really enjoy." Wood selection is critical and Theodore firmly believes in using locally sourced materials: "I live in Washington state, which is also called the Evergreen State for all of its trees and forests. I have also recently forged a new relationship with a Native American tribe that runs a sawmill here in the Pacific Northwest. This is going to allow me to procure cedar and other native woods that have been sustainably harvested. Sustainability is something that I am greatly passionate about both in my personal life and in woodworking. I strive to make a product that has a low environmental impact by using eco-based epoxies, locally sourced woods and tree lignin-based fibreglass cloth. I want to build something that is going to last for many generations." Theodore told us that he takes a lot of pride in all the little details: "I strive to make my boards almost completely out of wood and wood-based products. In main-stream surfboard and paddleboard construction, the leash plugs, vent plugs, fingerholds, and fin boxes are usually made of plastic. I've gone to great lengths to replace all of those components with resin-infused woods, which is a process that I do in-house. After infusion, each piece receives a couple of coats of acrylic sealer, ensuring that each piece is completely water-proof. 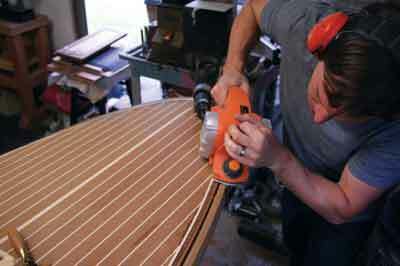 It's my mission to make some of the finest handmade hollow wooden paddle boards and surf-boards available." His approach to design blends woodworking with his knowledge of paddleboarding and surfing. "I usually have in my head a rough idea of the type of board that I want to create. With that in mind, I open up CAD on my computer and start to rough out the shape that I want to create. This has taken me a lot of years of studying board shapes and how they work. Not only are they visually appealing, they are also quite complex with the convex and concave shapes that help to push and pull the water where you want it to help control the board. As I'm designing in the digital world, I'm also thinking about the jigs that I will need to create to help press the board together. When I have refined the shape to my liking, I take and export slices of the board that are based off of 255mm centres over the total length. With that information I can take the negative space that is around that image and print it off to create a perfect 'clamp' on the top and bottom of the board. 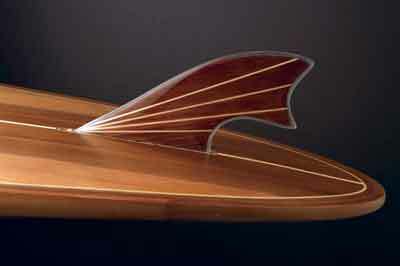 This allows me to introduce complex bottom contours on the board that assist with performance." The analogy he uses to explain the process is that of building an aeroplane wing. "A board has a skeleton interior structure that is surrounded with a wood shell. When it all comes together it forms a monocoque hull that is incredibly strong and lightweight," he explains. When asked about his inspiration and influences, Theodore finds inspiration from his surroundings in the Pacific Northwest and its rich sailing tradition. "Seattle is a maritime city nestled in the Puget Sound. It's rare to not see boats in every direction when you look to the water around here. I've always been drawn to sailing and have found wooden boats to be some of the most beautiful. I used to volunteer down at the Center for Wooden Boats and that's where my appreciation and fascination for the craft really grew. 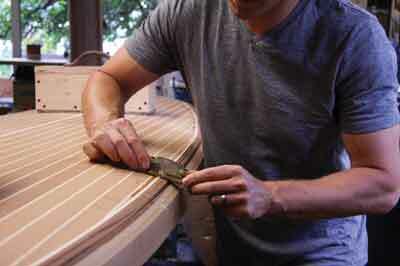 There is a lot of history and skill that goes into making a boat and so many directions that you can take it. But the day I saw another local surfer here in Washington who had made his own wooden board, I knew that was something I had to try. 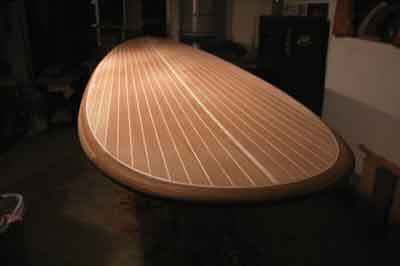 I became infatuated with how to make a modern, efficient and lightweight, hollow wooden stand-up paddleboard." The style of classic boats holds a particular appeal for him: "I was really drawn to the traditional teak (Tectona grandis) decks on wooden sailboats and have mimicked that style in my boards along with other nautical influences. 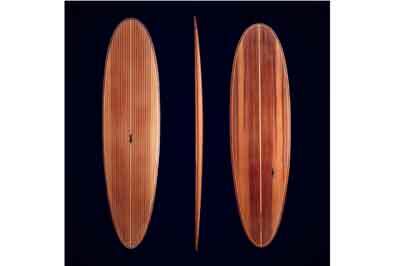 I want my boards to have a classic feel to them when you are out on the water, either paddling or surfing. I'm also influenced by some of the very high-end kayak and canoe makers here in the Northwest. I plan to start using some more detailed string inlay in my future models." Theodore is currently working on refining weight-to-strength ratios with his current flagship model the 'Seahurst' and plans to release a lightweight, high-performance model that will be much more responsive in the surf. He is also working on plans for a couple of displacement hull style paddleboards that resemble the look of a kayak more than a surfboard, along with a couple of boards that will be used more for surfing. 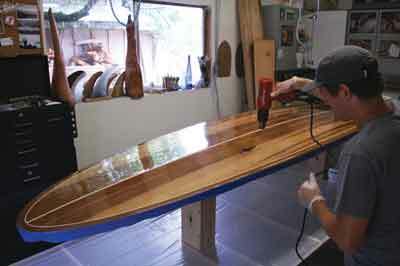 He also plans to continue building up his company, Red Cedar Paddleboards, and will be launching a website for it here. "I haven't had a mentor, and have learned everything I know about this craft by trial, error and untold hours of experimentation and research. 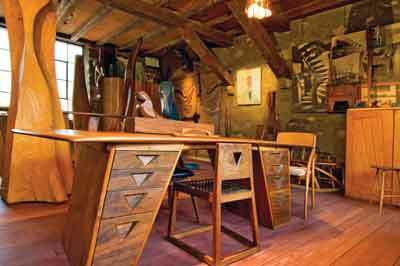 I am heavily influenced by the great woodworkers of the past century: Tage Frid, Wharton Esherick and, above all, Sam Maloof. I liked how he referred to himself as a 'woodworker'. He called it an honest word and that was something that really resonated with me. One of my favourite documentaries is about Sam. Although I never met him, I admire that he was such a hardworking, God-loving family man, who chased a passion his entire life. It's a video that just makes you feel better on a rough day. "I was inspired by his ability to take on the unknown. 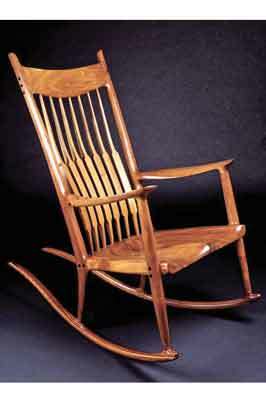 I remember reading about some of his original chair designs and how he wondered if the joinery would be strong enough. So he would take a prototype chair up to the top of his garage and throw it onto the ground. I like that grass-roots style of learning as there is no real book on making hollow wooden paddleboards. It's been a lot of trial and error with design and build methods. 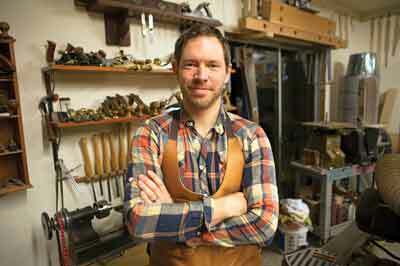 "One of the main reasons that I am such a passionate woodworker is to preserve the craft. Although I've never had a mentor, I hope to be a 'maker's maker' someday for someone else."